Within our curriculum documents, the areas of reading, writing, foundational skills, speaking, listening, and grammar are addressed at each grade level, meeting the standards set forth by the Common Core State Standards for English Language Arts. Because the English Language Arts are so highly integrated and interdependent, a balanced approach to instruction is therefore required. Characteristically, the development of literacy skills requires a spiraled curriculum where concepts are introduced, developed, and reinforced. Once introduced, most skills are repeatedly revisited within that grade level. They are reinforced in successive grade levels with increasing rigor and in greater depth. Because every learner is an individual with specialized educational needs, the Summit Public Schools presents its rigorous curriculum through the application of differentiated instructional strategies. Direct and explicit instruction as well as the application of research-based instructional strategies, such as problem-based learning, cooperative learning techniques, teacher and peer modeling, and the regular implementation of formative authentic assessments are fostered. The elective courses are intended to supplement interest in a given area of study and may not be taken in place of English 1, 2, 3, and 4 or Honors and AP sections of these courses. To function effectively as citizens and consumers, all students need to learn to enjoy and appreciate the value of mathematics and develop the mathematical skills they must have for varied educational and career options. Strong foundations in number sense and numerical operations form a basis for the successful use of mathematics. Students best acquire mathematics skills when they are engaged in activities that enable them to discover, understand, and apply mathematical concepts. When students are challenged to use mathematics in meaningful ways, they develop their reasoning and problem-solving skills and come to realize the usefulness of mathematics in their lives. The Board of Education has set a goal to make Summit the leader in STEAM education by 2018. STEAM--Science, Technology, Engineering, Arts (design) and Mathematics--is an integrated way to deliver curriculum and instruction offering problem-based authentic opportunities for learning. This approach is reflected in many courses across the curriculum. 1. Pose and solve real world problems. 2. Effectively communicate mathematical ideas. 3. Make connections within mathematics and between mathematics and other areas. 4. Provide opportunities for active student involvement. When math is taught in a problem-solving spirit, students are interested in what they are doing and are more likely to understand the material. Instructional strategies that allow students to talk and write about math helps to clarify and solidify their thinking and develop confidence in themselves as mathematical thinkers. Mathematics learning is not dependent on special abilities but can be achieved by all students by using organizational strategies such flexible grouping, cooperative learning, individualized and whole class instruction, differentiating instructional strategies, and by developing achievable high-level expectations. Students will develop positive attitudes toward mathematics when they are taught in a supportive, developmentally appropriate environment, when all students’ mathematical learning embodies the notion that engagement in mathematics is essential, and where decision-making, risk-taking, perseverance, self-assessment, and self-confidence are frequently the keys to success. 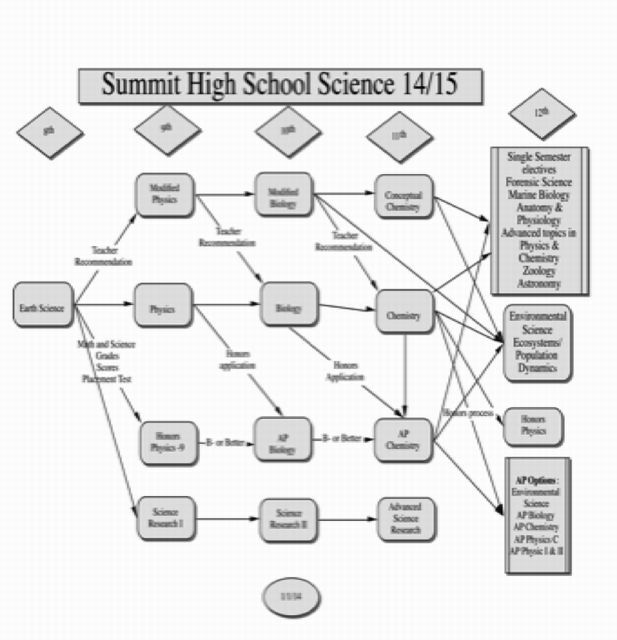 In order to graduate from Summit High School, students must successfully complete three full-year mathematics courses. AP Calculus BC/Physics C is an integrated course providing a continuation of the calculus work begun in Introduction to Analysis Honors and an introduction to the physics of mechanics. The course is taught during a two period block. Students receive grades for each class, which appear separately on report cards and transcripts. All students in this course will be required to complete a summer curriculum assignment. This assignment is designed to review key mathematical topics that will be utilized throughout the course. Additionally, all students enrolled in this class are required to prepare for and take the Advanced Placement Calculus BC exam in May and the Physics C Mechanics section, and Physics C Electricity and Magnetism section of the Advanced Placement exam in May. Calculus instruction includes the concept of limit, differentiation of algebraic and transcendental functions, differentials, mean value theorem, Rolle's Theorem, integration of standard elementary forms, and transcendental functions. Geometric and physical applications include the area under a curve and between curves, volumes of revolution, length of a curve, surfaces of a revolution, and velocity. The BC syllabus covers the topics of the AB Calculus course in greater depth and with more rigor. Additional topics include polar graphs, infinite sequences and series, and differential equations. Students receive a graphing calculator for their use during the course. Multivariable Calculus is offered as an online independent study experience. This course is a rigorous study of Multivariable Calculus. It is a challenging exploration of functions of several variables and includes the examination of such functions through the use of vectors and matrices, differentiation and integration, optimization, parametric curves and surfaces, and vector fields while also exploring real world applications. Students receive a graphing calculator for their use throughout the course. 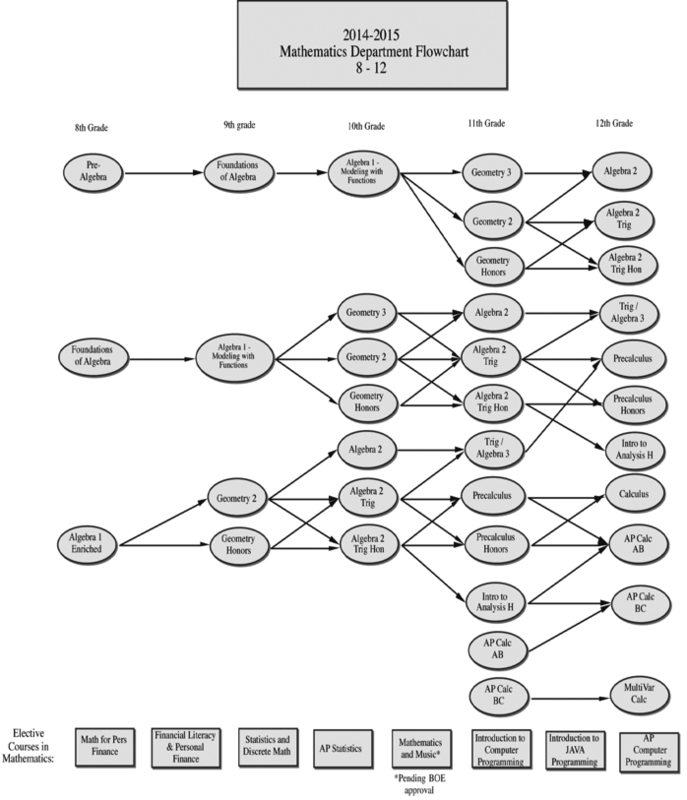 This course is equivalent to a semester of college level computer programming. Students who have been identified as partially proficient on the mathematics section of the NJASK 8 will be assigned to the Mathematics Strategies course in addition to their regularly scheduled mathematics class. This program is designed to help prepare students to develop mastery of the basic skills. Course content is based on the proficiencies and performance objectives described within the Common Core State Standards in Mathematics including the Standards for Mathematical Practice. Find or determine answers to questions derived from everyday experiences. Understand articles written about science. Engage in non-technical conversation about the validity of conclusions. Identify scientific issues underlying national and local decisions. Pose explanations based on evidence derived from individual work and research. The scientifically literate person has a knowledge base of facts, concepts and process skills that enable them to think logically and critically. Science process skills include communicating, measuring, observing, predicting, identifying variables, formulating hypotheses and experimenting. From the elementary grades through high school, science education is designed to provide learning outcomes that prepare students to use science to make everyday decisions and to solve everyday problems. Science education stresses the process and spirit of scientific inquiry. As a result, the methods of learning science reflect the methods of doing science. This approach allows students at all grade levels to become active participants in the process of scientific investigation. In order to graduate from Summit High School, students must successfully complete15 hours of science courses including physics and biology. This is a single semester science research class designed for students who are looking to continue authentic scientific research and/or a science research project begun in Science Research II. Students will be refining a sophisticated research project in the laboratory requiring long periods of continuous experimentation, research, and data analysis. Working with professionals and advisors to prepare the research for presentation outside the school, students will participate in an on-going process of both peer and mentor review that may continue for multiple semesters, and resulting in the student's active involvement in a variety of science fairs and competitions. Advanced Placement Physics I & II replaces AP Physics B, as required by the College Board. This is a fast-paced, mathematically demanding course providing students with a rigorous first-year college physics course. Topics include mechanics, waves, thermodynamics, atomic physics, electricity and magnetism. Through lecture, demonstration, laboratory work, and problem-solving sessions, students develop a working knowledge of the topics and are required to assume considerable responsibility for extensive study, including collateral reading. Extra laboratory periods are required during the school day. All students are required to prepare for and take the AP Physics I & II exam in May. Advanced Placement Physics C is designed for the student with exceptional aptitude for and interest in mathematics and the physical sciences. We utilize guided inquiry and student-centered learning to engage the development of critical and analytical thinking skills. The course will address all of the basic concepts covered in the first part of the regular level physics course but to a depth equal to that of a first year college course for students majoring in engineering or the physical sciences. The first part of the course (approx 18 weeks) covers mechanics, while the second part (approx 14 weeks) covers electricity and magnetism. The standards provide a framework to foster in students the development of an understanding of the world as our shared home, and an appreciation of our American heritage. The objectives identified are attained through the achievement of student literacy in four major social studies disciplines: civics, history, economics and geography. While each discipline contributes its own unique perspective of the world as our home, it is their integration that produces a truly literate understanding of history and social studies. In addition, the English language arts (ELA) Common Core Standards include supplemental guidelines for literacy in history and social studies. Teachers of history and social studies use their content area expertise to help students meet the particular requirements of reading, writing, speaking, listening, and using language effectively for college, career, and life readiness. Using primary and secondary sources, students are challenged and asked questions that push them to refer back to and to apply what they’ve read, emphasizing critical-thinking, problem-solving, and analytical skills. Within our curriculum documents the standards are addressed at each grade level with increasing rigor and in greater depth. In order to graduate from Summit High School, students must successfully complete three full-year history courses, including two years of United States History and one year of World History. This one-year interdisciplinary Global Studies class is a double-period course that combines freshmen year English and world history. Global Studies creates an environment that encourages students to make connections between world literature and world history. This course will trace the development and contributions of civilizations in different parts of the world. Primary emphasis is placed on the history and literature of cultures in Europe, the Far East, Africa and the Americas. The course will begin with a review of the major political and cultural legacies of the classical and medieval worlds, and it will end with the major global events of the 20th century and the post W.W. II era of globalization. Students will examine themes and literature that address current political, social, and economic trends and events that influence today’s world. Emphasis is placed on the development of skills that allow students to understand the past and apply those skills to questions they will encounter in the future. A research project, as well as various types of narrative and expository essays, are expected. Maintains physical, social, and emotional health by practicing healthy behaviors and goal setting. Engages in a physically active lifestyle. Is knowledgeable about health and wellness and how to access health resources. Recognizes the influence of media, technology, and culture in making informed health-related decisions as a consumer of health products and services. Practices effective cross-cultural communication, problem solving, negotiation, and conflict resolution skills. Is accepting and respectful of individual and cultural differences. Advocates for personal, family, community, and global wellness and is knowledgeable about national and international public health and safety issues. The standards topics for grades 9-12 include Wellness, Alcohol, Tobacco, and other Drugs, Family Life, and Community Health Skills during Health classes, and Wellness, Movement Education/ Rhythm, Cooperative Games, Individual Activities, and Team Activities during Physical Education classes. All students in NJ in grades 1-12 are required to participate in a comprehensive, sequential, health and physical education program for at least 150 minutes per week each year. In high school, students must complete at least 3 credits in health and physical education for each year of attendance in order to receive a state-endorsed diploma. Summit’s Health and PE program has been designed to provide learning opportunities for the physical and emotional development of individual students. Lessons are intended to motivate and educate students to protect, maintain, and improve their own health and that of others. As a department staff strive to meet the physical, mental, emotional and social needs of children through a wide variety of experiences, individual and group activities selected and conducted in accordance with the needs, interests, and maturity levels of the individual students and with the needs of the community at large. The Physical Education curriculum is organized to include a planned progression of skills and activities. Units are sequenced to target essential skills and build upon these skills as each school year, and cumulative school years progress. Through participation in the program this progression encourages student development of fundamental skills, cardiovascular awareness and fitness, individual responsibility, self-discipline, strengthened peer relationships, and leadership qualities. The goal of our program is to provide activities where self-expression, self-confidence, and physical and mental poise can be attained through perseverance and the mastery of physical, mental, and social tasks. Areas for students to excel beyond academics. Additionally, students who struggle in the classroom may find increased self-respect and a new sense of admiration from their classmates for their competence in PE. Physically and mentally healthy students are more likely to be prepared to meet daily challenges, and are more likely to make appropriate choices about lifestyles. Long-term health and wellness is promoted by making health and fitness fun, and by incorporating lessons on the importance of movement for overall health and disease prevention. The involvement of every student, with each student instructed at his or her level of ability. Encouragement for students to increase their knowledge of health and wellness and how it affects their lives. Providing students with the foundation to maintain their physical, social, and emotional health. The Summit public schools provide an enriched arts experience for all levels of education that is aligned to the standards. The NJ Core Curriculum Content Standards for the Arts includes dance, music, theatre, and visual art, while the New Jersey Core Curriculum Content Standards for 21st-Century Life and Careers Standards engage students in the process of career preparation by participating in structured learning experiences, specialized programs, and advanced courses that reflect personal aptitudes and career interests. Combined, the study of fine, performing and practical arts in the curriculum enables students to develop critical thinking and problem-solving skills, organizational, planning, goal setting, research, idea formation, and observational skills, while also nurturing creativity and innovation. Through the arts, behaviors of sustained engagement, self-discipline, and persistence are developed that can then be applied to any subject and any aspect of life. Artistic experiences are provided at all grade levels and at all levels of artistic ability to develop the creative potential in each child and to allow for maximum individual differences in expression and growth. Summit’s arts program teaches visual literacy and this education is a powerful influence in making students more discriminating and more sensitive to the things they see, use, and create. The buildings in which we live and work, the objects we use in daily life, our fashions and entertainment all depend on art. Art helps students make informed, conscious aesthetic judgments and decisions. Additionally, arts education is vital to the development of citizens in our society because it is one of the primary forms of communication. Through the arts, students also learn tolerance, respect, attitudes, and values of people of other cultures. Arts education fosters in students the capacity to appreciate diversity, sensitizes students to the feelings of others, and helps students to understand individual differences. Successfully participate in post-secondary education and careers. The Board of Education has set a goal to make Summit the leader in STEAM education by 2018. STEAM--Science, Technology, Engineering, Arts (design) and Mathematics--is an integrated way to deliver curriculum and instruction offering problem-based authentic opportunities for learning. This approach is reflected in many courses across the curriculum. Graphics and Engineering by Design is a one semester online course extension of all Technology Education classes. This course focuses on STEAM based projects with students creating working models using Design and CAD software. Topics of study include the design process, identifying areas of technology, design through discovery, 3D modeling, prototyping, and inventing. Students in this course are challenged to innovate and invent solutions to problems that occur in their daily life. This is an online course requiring students to complete activities on their own time each week. In addition, students meet with the instructor 1-2 times per month before and after school to work on their physical models, attend monthly meetings, and are required to present their projects. Students need to have access to the Internet and computer programs including Photoshop and Illustrator off site of the school. Advanced Photography is designed for students who have successfully completed Photography 1 and 2 and are interested in pursuing a serious in-depth experience in photographic imaging including the opportunity to develop their AP portfolio. Demonstrations and discussions focus on precise film exposure and processing, advanced printing, mounting and finishing studio portrait photography, and adventures in collage and digital imaging. Assignments explore a wide variety of viewpoints and subject matter. The Moving Image is a one-semester introduction to video and technical production techniques focusing on pre and post-production, layout, design, writing, and distribution of digital video and some HD format productions. Work produced in this course is displayed on the district television station. The Moving Image 1 The Moving Image 2 is a one-semester or full-year course that continues the production and editing of digital video projects. Elements of camera work, lighting, design, writing and post-production recording are stressed. Assignments consist of creative productions in video format. Work produced in this course is displayed on the district television station. Foods and Nutrition is a one-semester course that allows students to learn to prepare a variety of recipes related to basic food preparation of a variety of foods. Highlights include, basic baking, basic bread baking, pastas, and stir-fries. Nutritional needs, consumer considerations, table setting, manners, safety, career opportunities, and an understanding of the scientific principles used in food preparation and sanitation is emphasized. Students also use the computer for dietary analysis and recipe research. Foods and Nutrition 2 is a one-semester course providing opportunities for students to pursue more advanced cooking techniques, foreign foods choices, and entertainment menus. Information concerning safety, sanitation, nutrition, and food preparation is reviewed. Utilizing a variety of resources and references, students participate in planning and implementing individualized projects. Topics may include international cuisine, entertaining and party planning, small appliance research, individually selected demonstrations, and written restaurant reviews. Foods and Nutrition 3 is a one-semester advanced food preparation course. Class time is divided between the foods lab and the computer lab where students may research and design nutrition and menus. Fundamentals of mass food production, working with food in front of an audience, and techniques to enhance the ability to prepare a variety of attractive and delicious menus are explored. This one semester course provides opportunities for students who have successfully completed Foods and Nutrition 1 to pursue advanced baking skills. Students will be challenged in preparing a large variety of baked goods including breads, cakes, pastries, cookies, and more. They will participate in the creative art of cake decorating and other finishing techniques. Each baking unit will address nutritional concerns such as low fat baking, gluten free baking, avoiding additives, and healthy substitutions. Child Growth and Development is a one-semester course focusing on human development from before birth through the age of five. Students study pre-natal development, pregnancy, childbirth, infant care, growth, behavior, and developmental patterns of early childhood. Parenting, discipline versus punishment, and play are also covered. The course is designed to help students better understand the phenomena of birth and the development of children, and provides valuable career readiness information for working with young children. Interior Design is a one-semester course introducing the basic concepts of interior design including how the elements and principles of design are used to create pleasing environments. Design process steps, a variety of activities to provide insight into making educated buying and decorating decisions, career opportunities, and the expertise of guest speakers is explored. Intro to Theatre is a one-semester course that serves as an introduction to the fundamentals of acting and play production and offers exposure to a variety of dramatic texts. The major emphasis in the classroom is the introduction of basic acting techniques, theatre criticism, improvisation, stage diction, and movement. Students build the specific skills used in developing characterization and analyzing scenes. Student actors employ these skills in improvisational exercises and scene work. A general overview of other facets of theatre including technical, design, and theatre history, as well as the opportunity to participate in various workshops, master classes, and theatre field trips is also provided. Participation on some level, either as cast or crew member, in school productions is required. Theater 1 is a full-year course that serves as an introduction to the fundamentals of acting on stage and on film. Students are exposed to play production, stage terminology, and a variety of dramatic texts, and explore a variety of acting techniques that will assist them in recreating human behavior for the performance of any role on the stage or on the screen. The major emphasis in the classroom is the introduction of basic acting techniques, stage diction and movement. Students build specific skills used in developing characterization and analyzing scenes through improvisational exercises and scene work. A general overview of other facets of theatre including technical, design, directing, audition techniques, and musical theatre, as well as the opportunity to work in the SHS television studio filming their work for critique and for production on the SHS television channel are provided. Students also have the opportunity to participate in various workshops, master classes, and theatre field trips. Participation on some level, either as a cast or crew member, in the school productions is required. Advanced Theatre is a full-year course that builds on the skills gained in the first theater course and continues with more intense acting, forensic interpretation performance, audition, directing, film acting, and technical theatre skills and projects. Studies include an in-depth study of various acting techniques, classical acting styles and acting for film. The acting student works in the SHS television studio filming their work for critique and for production on the SHS television channel. Students participate in various professional workshops, audition master classes, and theatre field trips. The course culminates in a student-directed and produced Director’s Showcase. Participation on some level, either as a cast or crew member, in the school productions is required. The study of languages is an integral part of every student's academic preparation. The Summit High School world language program is comprised of Spanish, French, Mandarin Chinese, and Latin. Students are required by the State of New Jersey to successfully complete one year of high school world language study for graduation. Students in Summit have the opportunity to study Spanish from elementary school through their senior year, study French, Mandarin, and Latin from grade 6 through their senior year, and/or to choose a second world language in high school. Students are encouraged to further their knowledge and use of their respective languages beyond the classroom through extra-curricular clubs and cultural activities offered throughout the school year. Additionally, students are supported as they prepare to participate in local, state, and national language competitions and exams. The primary goal of world language study is communications proficiency. In addition to enhancing understanding of English and connecting other disciplines to the world language course of study, students learn to communicate through practice and presentation in all four skill areas including reading, writing, listening, and speaking. Course content is presented thematically, with the newest curricula written using the Problem-Based Learning model, linking learning outcomes to dealing with real-life issues and situations. Units of study may include vocabulary, grammar, conversation, reading passages, writing samples, listening activities authentic media, and videos all designed to develop students’ ability to use language authentically. The cultures of the countries where the world languages are spoken are also studied through readings, authentic media, videos, and class discussions. Students begin the year with a baseline assessment and use portfolios to reflect on their progress in developing language skills and strengthening cultural awareness. All world language students are expected to use the target language to present information, interpret authentic materials in meaningful contexts, and to communicate with each other, as well as with native / heritage speakers. All students are expected to use language to connect to other communities and to view cultures from different perspectives. Summit’s world language curriculum is aligned to the New Jersey Core Curriculum Content Standards and to the National Standards for World Language Education, as well as, with the proficiency guidelines established by the American Council on the Teaching of Foreign Language (ACTFL). The program provides students essential knowledge and skills to be informed, contributing members of the global society. Language and communication are at the heart of the human experience. The United States must educate students who are linguistically and culturally equipped to communicate successfully in a pluralistic American society and abroad. This imperative envisions a future in which ALL students will develop and maintain proficiency in English and at least one other language, modern or classical. Children who come to school from non-English backgrounds should also have opportunities to develop further proficiencies in their first language. French 5 Honors is a full-year course emphasizing communicative proficiency and based on the Problem-Based Learning Model. Students are expected to integrate the variety of skills built throughout the preceding levels of French and use their language skills to communicate about real-world issues. Students read, discuss, and write about literary and current fiction and non-fiction texts by French-speaking authors. Students respond to authentic materials available in print, online, and in video. Students compare and contrast perspectives on these issues with students in Montpellier, France. Latin 2 is a full-year course that continues student development of basic Latin grammar and vocabulary with readings of graduated difficulty on Roman life and mythology. Students continue to develop speaking skills and guided writing enhances student understanding of Latin constructions. Latin 3 is a full-year intermediate course that broadens the student's knowledge of grammatical structures and vocabulary. Students gain increased facility with the language from reading selections about Roman life, mythology, and civilization and responding to the readings with appropriate writing. Discussion of the text includes the development of cultural and linguistic understanding. Latin 4 is a full-year translation course with readings of Pliny, Ovid, Plautus, Cicero, Eutropius, and Lucretius. Emphasis is placed upon strengthening the grasp of advanced Latin grammar and vocabulary, as well as extending this knowledge to include more complex forms and concepts. Films, recordings, and non-book materials are used. Literary criticism and English vocabulary comprehension development are stressed. AP Latin is a full-year course requiring students to read Caesar with the objective of exploring in detail two Classical texts to understand their meaning, historical importance, cultural background, effect on modern literature, and their poetic/prose styles. All students enrolled in an AP class are required to take the AP exam in May. Mandarin Chinese 1 is full-year course focusing on student development of communicative proficiencies, Pinyin use, character writing and decoding, and cultural understanding with the objective of students using Mandarin appropriately in culturally authentic situations. Theme-based work provides interesting and real-life opportunities to practice the skills necessary to develop novice proficiencies in interpretive, interpersonal, and presentational language skills. Spanish 1 is a full-year course focusing on student development of communicative proficiencies and cultural understanding with the objective of students using Spanish appropriately in culturally authentic situations. Theme-based work provides engaging, real-life opportunities to practice the skills necessary to develop novice proficiencies in interpretive, interpersonal, and presentational language skills. AP Spanish 6 is a full-year course where students engage with issues at an advanced level including historical and cultural causes and outcomes of immigration and emigration, personal, literary, and cultural duality, gender in Spanish literature, culture and media, and current trends in culture, politics, and policies within, and outside of the United States. Students are expected to integrate a wider vocabulary, sophisticated use of grammar, and knowledge of Spanish-speaking cultures to discuss these issues. Students read a wide spectrum of literature, non-fiction text, and current news sources, view Internet clips and television programs, listen to music and news, and use these authentic resources as vehicles for conversation and critical thinking. All students enrolled in an AP class are required to take the AP exam in May. Learning in the 21st Century. All students will have the option to take the AP exam in May, but are not required to do so. Standard English for Ells 1 is for students who have recently arrived to the United States and are not familiar with the English language. Students will understand the structure of English as well as acquire the grammatical foundations necessary for interpersonal, intercultural and instructional purposes. Additionally, learners will develop academic language or CALP (Cognitive Academic Language Proficiency) in order to be successful in school and beyond. Students will enhance English skills in all four domains: reading, listening, speaking and writing. Students will also produce work conforming to WIDA Language Development Standards and New Jersey Learning Standards. English as a Second Language Advanced is for students who have a near mastery of the English Language. Students will learn about the English language as an art form and as a tool to communicate using appropriate English conventions. Students will enhance English skills in all four domains: reading, listening, speaking and writing. Students will strengthen critical thinking skills as well as how to apply those skills for success in the classroom and beyond. Each unit includes authentic materials and resources. Students will also produce work based on these models while conforming to both New Jersey ELA Learning Standards and WIDA Language Development Standards.